In my previous post, I complained about the non-functional water fountains at SacRT light rail stations, but in doing so, I remembered that I’d never posted about the water fountain on M Street in Sacramento. Herewith is my paean to the M Street water fountain. 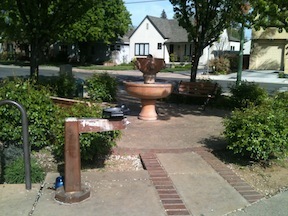 In a tiny triangle park at M Street and 48th Street in East Sacramento is a wonderful thing, a public drinking fountain. Not only is there a drinking fountain, but also a decorative fountain, and benches, and flowers, and shrubs, and a patch of grass. I stop here on every trip, whether I’m thirsty or not, just to celebrate this little corner. Sometimes I’ll stop and lie on the grass, or sit on the bench and enjoy the fountain. Other times, it is just a quick drink and on with my trip. I’ve seen mothers here letting their kids play, and retired folks just passing the time. There is always a bowl beside the fountain for dogs to have a drink as well. In my previous post, I suggested two major changes to the street grid in downtown/midtown Sacramento, one to eliminate one-way streets, and the second to convert all three-lane streets to two-lane streets. Of course there is an overlap between these changes, as all of the three-lane streets are also one-way streets. The goal of these changes is to make it harder to commute to and from downtown Sacramento by car. Yes, that is my intention. By way of explanation, I go back to Williams Burg’s documentation of the intentional de-population of downtown, and to a smaller degree, of midtown. There is an insufficient housing stock of all types in the downtown area, and in the midtown area there is a lack of some kinds of housing, primarily single family housing. I’m not talking here about separate housing, the suburban model of isolated houses on isolated lots in isolated communities, but of housing designed for families to live in that are not like apartments with shared facilities. Tapestri Square on 20th St is one example of this kind of single family housing, but there are many more both new and older. And of course there are Victorians still available which have not been subdivided into spaces too small for a family. Housing is gradually being added back into midtown. Where I live at 16th & O, there are two new mixed-use buildings going up, retail below and apartments above. There are others in midtown, and even a few in downtown.